it is not that bad 3 mana play... by arena standards. 2 mana 1/1 is pretty bad, but the lackey seems pretty useful, so there's that. I am so glad that we got a neutral lackey generator. Not sure if this will see play unless lackeys are needed for the deck. However, the value of lackeys are pretty good. This is too slow and small for Master's Call hunter. Midrange hunter needs 1 and 2 drops with some teeth and body if they plan on getting max value from their only real option for draw. Rage quitting: the best way to ensure your opponent knows they beat a giant baby. kind of like a Novice Engineer but with guaranteed value on turn 3? So not that bad actually. Oh... Thanks for the correction, My brain malfunctioned... Yes, random 3 drop + 1\1 should be in a 3\4 range on average and absolutely fine in arena. Well, this was the card i was looking for to make a janky lacky shudderwock deck. It's a plus in my book. *Evil rat 1*: - What are we going to do tomorrow night? *Evil rat 2*: - The same thing we do every night... RIDE A FAT HUGE MOUSE... and try to take over the world! All the lackeys have strong battlecry effects and this card gets you one through battlecry. So I can totally see myself putting it in any deck that runs rogue totems in it. Evil Cabal Rat? Did they mean cabal? Cabal rat? 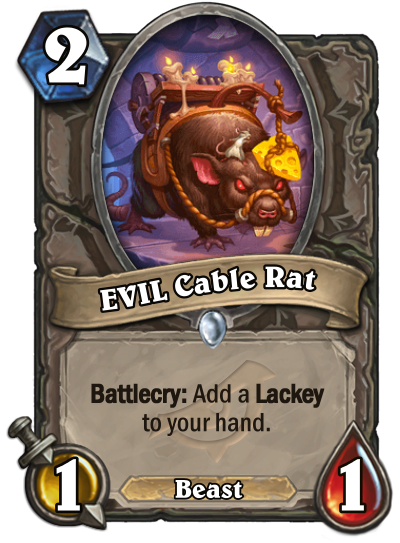 Cable Rat... eats wires? cables? WHAT THE F^@& IS A CABLE RAT!